As part of the partnership, West Monroe invests in Ellevate memberships for all of its women at the senior consultant level and above. Through our partnership with Ellevate, our women are developing new mentoring and peer relationships that are helping them tackle challenges, prepare for leadership roles, and improve career satisfaction. West Monroe Partners, a national business and technology consultancy, today announced that it is extending its partnership with Ellevate Network to a second year. The partnership, established in March 2017, is one aspect of the firm's initiative to build the next generation of women leaders within West Monroe. Ellevate Network is a global professional network for women whose mission is to close the gender achievement gap in business. As part of the partnership, West Monroe invests in Ellevate memberships for all of its women at the senior consultant level and above. These memberships provide West Monroe's women employees with opportunities to build their personal and professional networks, develop professional skills, and enhance their personal brands. "Feedback indicates that this opportunity to share experiences with other women in the Ellevate Network is both valuable and highly valued," said Susan Stelter, West Monroe's chief people officer and executive sponsor of the partnership with Ellevate. "Through our partnership with Ellevate, our women are developing new mentoring and peer relationships that are helping them tackle challenges, prepare for leadership roles, and improve career satisfaction." 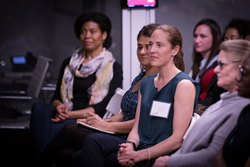 During the partnership's first year, West Monroe hosted or co-hosted Ellevate events in Seattle and Chicago. In addition, the firm's women leaders contribute to the Ellevate Network's resource library on Forbes by publishing articles, blogs, and podcasts on topics such as working parents, breaking down barriers to inclusion, gender disparity in the workplace, and gender stereotyping. The organizations plan to build on these activities over the second year of the relationship. "We are thrilled with the contributions that West Monroe has made to our network during the first year of our partnership. The firm's women leaders bring a wealth of experience navigating dynamic business environments and careers, and we are pleased that they have been so open to sharing their perspectives with our members," said Kristy Wallace, CEO of Ellevate Network. "We are excited to extend our partnership with West Monroe and look forward to the coming year of collaboration and mutual benefit." The partnership is part of West Monroe's strategic Inclusion & Diversity initiative and one of several steps the firm is taking to diversify its workforce. A key goal of for the partnership is to attract female talent to the consulting industry and make the firm an optimal place for women to build fulfilling careers. "Gender diversity is important to us - it benefits our firm and our clients. However, as is common in professional services, we see our percentage of women decrease at more senior career levels. Our partnership with Ellevate is one step we are taking to close that gap and build the next generation of women leaders within West Monroe," said Kevin McCarty, the firm's CEO and president. "It is important for our women to have access to female mentors, peers, and role models. This partnership is proving a very valuable way to accomplish this and complement the networking and mentoring opportunities we provide internally." Ellevate Network is a global professional women's network committed to elevating each other through education, inspiration, and opportunity. Its mission is to close the gender achievement gap in business by providing women with a community to lean on and learn from. West Monroe is a progressive business and technology consulting firm that partners with dynamic organizations to reimagine, build, and operate their businesses at peak performance. Our team of more than 950 professionals is comprised of an uncommon blend of business consultants and deep technologists. This unique combination of expertise enables us to design, develop, implement, and run strategic business and technology solutions that yield a dramatic commercial impact on our clients' profitability and performance. For more information, visit http://www.westmonroepartners.com.